After driving arguably the greatest lap ever in Formula One history, Senna underlined his mastery of the wet at Donington Park. It was no surprise to see the Williams duo of Alain Prost and Damon Hill occupy the front row after a dry qualifying Saturday with Michael Schumacher third ahead of Senna's less powerful McLaren-Cosworth. But it was a different story on race day as Prost led Hill away in the pouring rain. Schumacher blocked Senna, allowing Karl Wendlinger to jump the pair up to third so Senna found himself back in fifth. What followed has gone down in F1 folklore. Schumacher was his first victim, Senna passing at the exit of Redgate Corner. He then passed Wendlinger through the Craner Curves to move up to third when he arrived at the Old Hairpin. As the leaders climbed the hill he closed on Damon Hill, slithering past at Coppice Corner. And by the time Prost reached the Melbourne Hairpin, Senna was right behind his old rival and dived down the inside. Amazingly, by the end of the opening lap, he was ahead. Intermittent rain for the remainder of the race led to a melee of pit stops for wet and dry tyres but Senna twice gambled to stay on slicks longer than his rivals, enough to give him victory from Hill and Prost. With Niki Lauda leading James Hunt by three points heading into the final round in Fuji, the title showdown was set for an epic after Hunt qualified second ahead of his rival. But on race day, the weather was dreadful, turning the circuit into a river and a veil of fog had also descended. Intense debate among organisers and drivers ensued as to whether the race should go ahead and it was decided that it should. Hunt led from Mario Andretti and John Watson but Lauda found himself among a midfield melee with reduced visibility. After a season that had seen him barely escape with his life at the Nurburgring, Lauda decided enough was enough and pulled into the pits. He was quickly joined by Carlos Pace and Emerson Fittipaldi. Hunt showed supreme skill and bravery to lead in the wet but as the circuit dried, he began to fade and was passed by Patrick Depailler and Andretti. Depailler then pitted to repair a deflated left rear tyre before surging back past Alan Jones and Regazzoni into second. Hunt suffered a similar fate, dropping to fifth but he summoned the resources to also pass the duo to finish third and with it, take the world title. A courageous drive in the most testing of conditions. The Belgian Grand Prix has become renowned for dramatic weather-affected races throughout its history and the first ever grand prix at the famous Spa-Francorchamps circuit set the mould. After three hours of heavy rain at Spa, a soaked Alberto Ascari produced one of the first great drives at the venue, crossing the finish line just under two minutes clear of second-placed Ferrari team-mate Giuseppe Farina. It was a true masterclass of wet-weather driving, the Italian maintaining a steady pace and steely nerve as others fell by the wayside. Pierro Taruffi spun at Malmedy before being hit by Jean Behra and even Stirling Moss succumbed to the conditions. A measure of the enormity of his victory was the fact that Robert Manzon finished four and a half minutes adrift in third. After suffering gearbox problems during qualifying, Jim Clark lined up on the third row of the grid alongside Jack Brabham for the Belgian Grand Prix. Few expected the Scot to make significant headway but with rain hitting the circuit on race day, Clark made an extraordinary start to make up seven places and lead on the opening lap, surging past the likes of Graham Hill, Dan Gurney and Bruce McLaren. The race quickly developed into a battle between Clark and Hill but as another storm sent a fresh shower over the circuit, Hill faltered with gearbox issues. 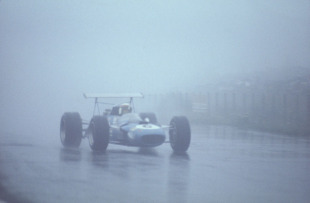 Gurney moved to second before Tony Maggs spun from third in the treacherous conditions. 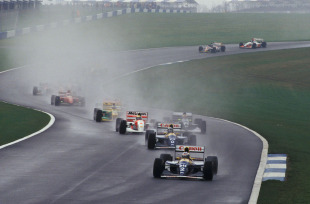 But at the front, Clark continued to display a mastery of the wet to win by just under five minutes from McLaren. Senna's second entry in the list was his superb drive to his maiden grand prix victory at Estoril. After his brilliant drive through the field to second at Monaco a year earlier, it confirmed that the young Brazilian was truly a master in the wet. It was raining so hard on race day that several drivers spun off on their reconnaissance laps, including Nigel Mansell who had to start from the pit lane in his spare Williams. When the race did get underway, Senna led off the start from pole and, with a relatively clear track ahead of him, simply put the hammer down and sailed off into the distance in majestic fashion. Even Alain Prost, soon to become Senna's biggest rival, found the conditions too much for his usual masterful control and spun off in spectacular fashion on lap 30. Such was Senna's dominance, he won by just over a minute from Michele Alboreto's Ferrari. To win in terrible conditions by a margin of just over four minutes is the mark of a true champion. Along with the great Juan Manuel Fangio, Stewart is the only driver to have won three times around the awesome Nurburgring in Formula One and none of these was greater than in 1968. So bad were conditions on race day that the start was twice delayed, Stewart one of the drivers in favour of not starting. Graham Hill still led the championship and he duly took the lead in steadily worsening conditions but by the end of the opening lap, and from sixth on the grid, Stewart led. He quickly powered past a poor starting Jacky Ickx, the Belgian making a mess of things from pole. Hill, Jochen Rindt and Chris Amon were next, Stewart leaving his rivals quite literally in his wake before disappearing into the mist. It was the last they would see of him, the Scot winning by just over four minutes on a track where overtaking was hard enough in the dry! After one of the most treacherous and frightening grands prix of all time, John Surtees emerged victorious as only seven cars made it to the finish line. Having qualified on pole, Surtees took an early lead as chaos ensued behind him. A torrential downpour just three miles in saw Jo Bonnier, Mike Spence, Jo Siffert and Denny Hulme all go off. Jochen Rindt spun at the Masta Kink but continued, others were not so fortunate. Jackie Stewart, Graham Hill and Bob Bondurant all lost control at exactly the same place as Rindt. Bondurant's car overturned but he escaped with cuts and bruises. Hill's car was undamaged but he stopped to try and help Stewart, who was trapped in his upturned car in the basement of a farm building, covered with petrol and with a broken shoulder and a cracked rib. It took Hill and Bondurant 25 minutes to extract Stewart. Rindt briefly passed Surtees for the lead but Surtees, having proved not only skilful but supremely brave in early laps, got back past as the track finally began to dry and held out for victory. Trailing Michael Schumacher by five points with two rounds remaining, Hill could not afford to let his rival stretch his lead further going into the penultimate round at Suzuka. And when rain hit the circuit on race day, many were writing off Hill's title chances against the renowned 'Regenmeister'. Schumacher started on pole ahead of Hill and slithered in front of the Williams to defend his position. Heinz-Harald Frentzen then spun off trying to pass Hill before the safety car came out amid worsening conditions as Jonny Herbert spun into the pit wall. Hill hounded Schumacher upon the restart but a spate of further spinners, including Gianni Morbidelli and Martin Brundle, signalled a re-start. Schumacher was the first of the leaders to stop but took on more fuel than Hill, gambling on a shortened race. Hill emerged ahead and stayed there as Schumacher had to stop once more, the Englishman holding on to win by three seconds. He had defied the odds to beat Schumacher in the wet and just when it mattered most. Widely acknowledged as one of the great wet-weather drivers, Michael Schumacher provided perhaps his greatest masterclass at the 1996 Spanish Grand Prix. The utterly dominant nature of his 45-second victory was made all the more impressive that he did so in a Ferrari that was a lot slower than his Williams rivals over the course of the season. Visibility was down to such a minimum that the drivers could barely see the front wings of their own machines, let alone the lights of the cars ahead but Jacques Villeneuve and Jean Alesi managed to get the jump on pole-sitter Damon Hill at the start. Behind the leaders, Schumacher found himself with work to do back in seventh, having lost four places. Chaos ensued as cars punted one another into retirement without having the slightest idea of who they hit or how it happened. By the end of the opening lap, six cars were already out. By less than half distance, half the field, including Hill, had gone. By lap 12, Schumacher was leading, having passed Gerhard Berger, Alesi and Villeneuve. And once in the lead, he proved unstoppable, setting fastest lap after fastest lap to hammer home his point. He was the quickest driver in the field despite his machinery. It was the drive that marked out Sebastian Vettel as a true star of the future as the German became the youngest driver to win a Formula One race. It's often said that rain is a great leveller, separating the best from the rest, and so it proved as Vettel had to rely on his raw driving talent in a Toro Rosso car far inferior to the established manufacturers. Vettel had made the paddock sit up and take notice of his penchant for wet conditions by taking pole position on Saturday, making his race day easier as the field started behind the safety car in similarly appalling conditions. With a clear track ahead of him, Vettel began to steadily pull away from McLaren's Heikki Kovalainen and pitted with a lead of more than ten seconds on lap 18. With his second stop coinciding with a drying circuit, he had the race in his pocket. A mature drive for one so young, as acknowledged by Lewis Hamilton. 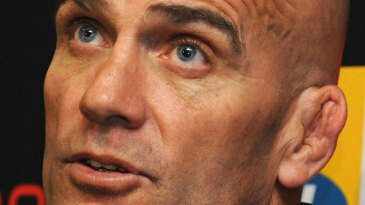 "With all that pressure it is easier to make mistakes, and he obviously didn't, so congratulations to him. He did a good job."